As long as Melissa McCarthy keeps doing an impression of him on Saturday Night Live—which, this being SNL, could be as long as he holds his job—Sean Spicer will have to keep doing his impression of someone who can take a joke. 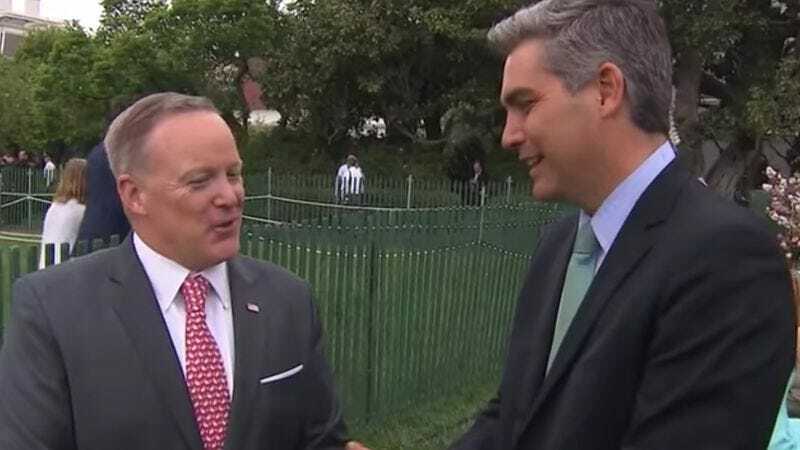 The White House Press Secretary has pretended to laugh off the orchestrated digs before, but when CNN’s Jim Acosta stopped him on the White House lawn to genially question him about the latest sketch, Spicer switched tacks. He now says he’s usually in bed, dreaming of sermons and righteousness, by the time the blasphemy begins on SNL. “I’m in bed, get up, go to church the next day and look ahead,” Spicer said with a too-hearty chuckle. Nice to know he hasn’t lost any sleep over his latest gaffe. When Acosta tried to press him further, Spicer started babbling about his role as press secretary, throwing in a reference to how the First Amendment protects that kind of speech, which did not at all sound like a threat coming from the man who often complains about the protection of anonymous sources. Still, Spicer did seem surprisingly upbeat, given the circumstances—the once and possibly future Easter Bunny had to sit this year’s festivities out.